The drug is manufactured in 50 and 100 ml glass and polymeric bottles. Combined drug with antibacterial and anti-inflammatory properties. Concentration in inflammatory lesion is 6 times higher than in other tissues. Convenient method of administration. The drug rapidly absorbs in injection site and offers long-term effect (up to 24 hours) on animal organism. 1 ml of Aziflumin contains azithromycin dihydrate - 100 mg and flunixin meglumine - 44 mg (26.5 mg of flunixin) as active ingredients, as well as excipients. Aziflumin is a combined drug based on macrolide antibiotic and nonsteroidal anti-inflammatory product. Azithromycin (a component of the drug) is a broad-spectrum macrolide antibiotic of azalide subgroup. It well absorbs and rapidly distributes in tissues obtaining high concentrations which are in large excess over peak plasma ones. High antimicrobial activity is also provided by azithromycin ability to penetrate and accumulate within cells and leucocytes (granulocytes and monocytes/macrophagocytes) with which it is transported to inflammatory lesions. Due to this fact, antibiotic concentration in this area is 6 times higher than in intact tissues. Azithromycin is slowly excreted from organism. That is why it enables to administer the drug once a day and reduce treatment course duration to 5 days. High active substance concentrations remain within 5-7 days after the last azithromycin administration. Flunixin meglumine (a component of the drug) is a nonsteroidal anti-inflammatory product with frank analgesic, antipyretic and anti-inflammatory properties. This substance rapidly absorbs in injection site and penetrates within most of organs and tissues obtaining peak concentration in 5-45 minutes. Due to accumulation in inflammatory lesion, it provides therapeutic effect within 24-36 hours. 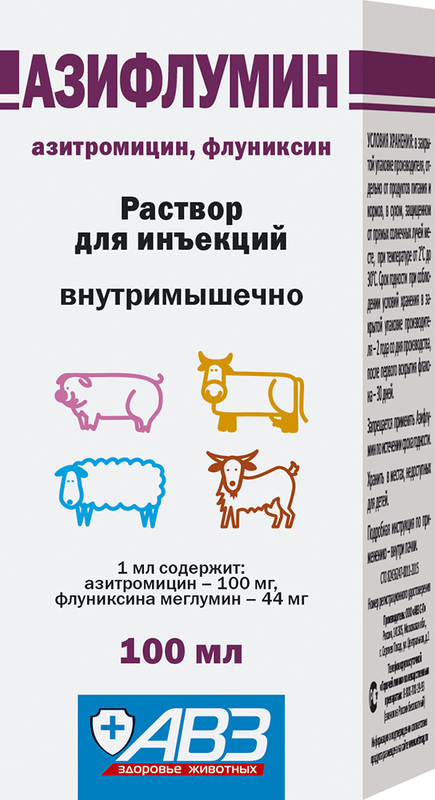 Use Aziflumin to treat pigs, cattle and small ruminants with bacterial and mycoplasmal diseases of respiratory system, gastrointestinal tract, urogenital system, skin and soft tissues (including borreliosis, necrobacillosis, swine erysipelas, spirochetosis, chlamydiosis), mycoplasmal infections and other primary and secondary ones, agents of which are susceptible to azithromycin. Do not use in pregnant and lactating females, animals under 6 weeks old and pigs <6 kg; in animals with renal, hepatic and heart impairment, as well as in increased sensitivity to macrolide antibiotics. Intramuscular administration once a day in dose of 1 ml per 20 kg of body weight within 3-5 days. Adverse events and complications are not available in case of administration as per this package insert. Rarely an oedema may be observed in injection site which naturally disappears within several days. In case of increased individual sensitivity to macrolide antibiotics and allergic reactions, stop drug administration and perform desensitizing therapy. Cattle are allowed to be slaughtered for meat not earlier than 28 days after the last drug administration. This term is 38 days in small ruminants and pigs. Meat of compulsorily slaughtered animals received before stated period termination can be used to feed fur animals. Store at 2-30°C. Shelf life is 2 years from manufacturing date and 30 days after the first bottle opening.